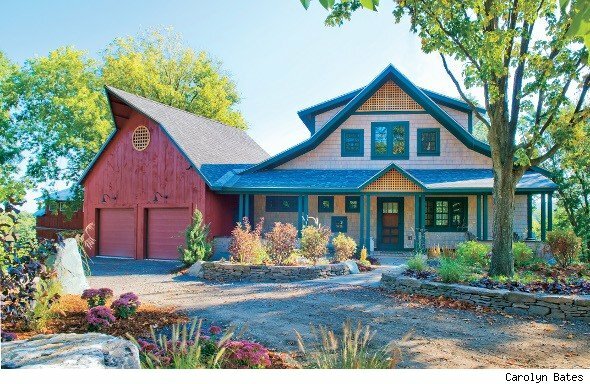 While picking up some prescriptions recently, my local pharmacist, who knows I write about home construction, asked me if I had any suggestions for how he should build his new house. Since I'm a big advocate for prefab, I suggested that he consider building his house modular. His response shocked me: "I wouldn't want to build modular -- it would upset my neighbors and bring down the neighborhood." I thought that type of thinking about prefab was ancient history, but his response was clear evidence that it is not. After having written several books on the subject -- filled with evidence of the beauty and diversity of prefab -- I thought we had moved past the bias that prefab is synonymous with double-wides. With all that I've learned over the years, I would never consider building a house on-site. The feedback that I get from my readers, when they have acquired some knowledge of prefab, is that they've become believers -- and wouldn't consider the on-site option either. As an environmentalist, there are many reasons to prefer prefab. Much of the on-site construction debris goes into a dumpster -- the homeowner is paying for the debris, dumper and tipping charges. Prefab houses are built in an environment where the wood is protected from the elements and has less chance of developing mold and rot. And it and won't twist and buckle, creating thermal bridges where air will infiltrate. Furthermore, prefab houses are built by professionals under the watchful eyes of supervisors who are checking the work all along the process. Several years ago the Structural Building Components Industry compared the construction of a site-built house to a panelized one in a study called "Framing the American Dream." The panelized house took substantially fewer hours to build, used less lumber, created far less scrap and cost 16 percent less in labor and materials. Another study from a coalition of Philadelphia building experts, titled "Going Mod," found a $32 savings per square foot using modular rather than site-built construction. I have also been influenced by the recent power outages in the Northeast. Twice in the last six months, it took Connecticut Light and Power almost a week to restore power to my neighborhood. I began to consider how wonderful it would have been to be somewhat independent of the grid (the power utility) and be able to sustain at least some of the energy in our house during those outages. Through my research I've found numerous ways of limiting the need for energy in the home and several ways to create energy without the need for fossil fuel. Sheri Koones is an award-winning author of five books on home construction, with the last several focusing on prefabricated construction. Her most recent book is "Prefabulous + Sustainable." Her latest work, "Prefabulous + Almost Off the Grid," will be released in October 2012 by Abrams.